So that's it from a busy old day of Premier League news conferences, which saw Scott Parker talk about his mixed emotions at becoming Fulham's caretaker manager while Brendan Rodgers said that Leicester City "would not have waited" for him after leaving Celtic to become the Foxes' new boss. Thanks for joining us today. 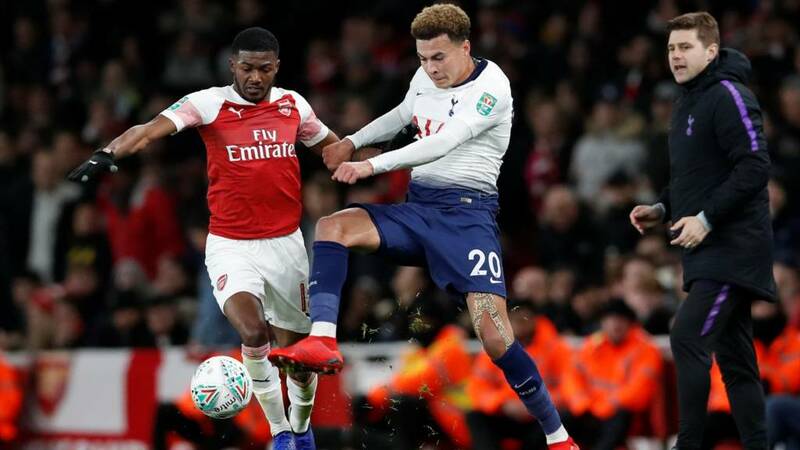 We'll be back on Saturday for the build-up to the north London derby, before which ex-Arsenal defender Lee Dixon has said doubts over Tottenham's team mentality will remain until they win a trophy. Until then, we'll leave you with Mark Lawrenson's Premier League predictions and our Fantasy Football tips - don't forget to change your team in time for Saturday's north London derby (12:30 GMT). After a difficult start to the season, back-to-back wins have seen Newcastle move six points above the relegation zone and within touching distance of the top half of the table. However, manager Rafa Benitez is determined for his players not to get too far ahead of themselves and still views survival as the main goal. He said: "Three or four weeks ago we were thinking it would be very, very difficult, now we are starting to talk about, 'Maybe you can finish 10th'. "It is, for me, very clear - we have to stay calm, we have to go there, try to get three points and if we can, fine, if we cannot, carry on. "I have said in a lot of interviews that the Fulham game, the last one of the season, will be the most important - hopefully not, but we have to make sure that we continue doing things in the same way that we are doing already." Nuno Espirito Santo has confirmed that goalkeeper John Ruddy will play in his first Premier League game of the season at Molineux so he can get some game time ahead of their FA Cup quarter-final against Manchester United. Ruddy hasn't played a game in the top flight since Norwich's 3-0 defeat at Everton in May 2016. Despite being open about his side's mindset ahead of tomorrow's derby, Emery was less clear on what role Mesut Ozil might play in the game. “We are doing a plan for a lot of matches and each match is different," he said when asked if the German would start. "Home and away, it depends on the position and how we are in each moment. “The most important thing for me is if the player can be OK for tomorrow and has the desire to play. “I think Mesut has this if we decided to play him tomorrow. He has had injuries, including to his back, and has been sick. Arsenal manager Unai Emery has also been speaking ahead of Saturday's north London derby. Victory for the Gunners will see them move just one point behind Tottenham in the Premier League table. “We have been speaking about the opportunity [to finish above Tottenham]," said Emery. “Each match is giving us the opportunity to win three points. There were 10 points between us and Tottenham two weeks ago and now it is four points. “The big opportunity for us is to play with confidence in our moment. They have lost two matches but they are still having a very good season. Looking forward to this weekend's game against Arsenal, Mauricio Pochettino has said he will have no problems motivating his Spurs side. "We know very well what it means to play against Arsenal. We know that we're going to be very motivated and we'll have a team that is very motivated too. "They have very good players, they are doing a very good job. Unai Emery is a great manager, of course it's going to be tough. "Derbies are always tough, after my experience here in nearly five years, every time that we played against Arsenal it was a very tough game." Mauricio Pochettino has said it is 'nearly impossible' for his Tottenham Hotspur side to win the Premier League title. Wednesday's 2-0 defeat against Chelsea leaves Tottenham nine points behind leaders Liverpool heading into this weekend's North London derby. "It was difficult after the Burnley defeat and after Chelsea it’s nearly impossible," said Pochettino. "We need to win all our games and need the two opponents above us need to lose a lot of matches. In this type of period it’s going to be difficult. "Of course we want to be dreamers until you finish and mathematically it's still possible but the possibility, or the percentage, is not too big." Manchester City enter this weekend's Premier League games just one point behind current leaders Liverpool, but manager Pep Guardiola claims that his focus is solely on tomorrow's game Bournemouth. "We are one point behind with 10 games left - many things can happen," he said. "We have the Champions League round the corner and we have the FA Cup, so a lot of games - let’s hope the players recover well. "Bournemouth are completely different at home from the team who play away. They beat Chelsea 4-0 not long ago! That’s my concern, not the future, the pressure. It makes no sense, nobody knows." Brendan Rodgers has been responding to the reaction of Celtic fans following his decision to leave the club midway through the season. Rodgers won all seven domestic trophies on offer during his time at Celtic and he left the defending champions top of the Scottish Premiership, eight points ahead of rivals Rangers. "I’ve seen some of what’s been said and read," he added. "Celtic supporters will hurt - I understand how they feel. They’re hurt and are maybe a bit worried. "But what we’ve put in place in the last three years will stabilise the club moving forward. "As hard as it was to make the decision, I knew that the improvements we made would allow the club's success to continue." Chelsea boss Maurizio Sarri has no injuries to consider but expects to rotate his options after a challenging week. "I think we need to change three or four players, I don't know how many (precisely)," he said. "On Sunday we played for 130 minutes and 95 minutes on Wednesday, so we need to value the recovery. "We ran for 15 kilometres on Sunday on average, and the average of the last match was 12km. I need to value the recovery of every single player. Then we have to decide (the team)." Asked about the departure of Claudio Ranieri ahead of Sunday's west London derby, Chelsea boss Maurizio Sarri said: "I'm really very sorry. But I know very well his character, so I know very well that we will see him very soon, on another bench. "Usually when there is change of the coach there is a reaction. And so we have to front (face) also the reaction. "Then it's very difficult for us to prepare the match, because we don't know the new system, the new ideas. It's a very difficult match, I think." Kepa Arrizabalaga could return in goal for Chelsea. Willy Caballero started Wednesday's win over Tottenham as Kepa was disciplined for his refusal to be substituted in last Sunday's Carabao Cup final. The pair will share goalkeeping duties in the Blues' next two games, with Chelsea to play Dynamo Kiev in the Europa League next Thursday. Head coach Maurizio Sarri said: "The Kepa situation now is closed. Kepa is our first (choice) goalkeeper. "But we are very happy for Willy, because now we know very well he's able to play also in a very difficult match. I'm sure in one of the two next matches Kepa will be on the pitch." Arsenal defender Laurent Koscielny should be fit despite being forced off in Wednesday's 5-1 win over Bournemouth after taking a knock to his knee. Stephan Lichtsteiner (back) is also available while long-term absentees Danny Welbeck (ankle), Hector Bellerin and Rob Holding (both knee) are still missing. Here's more from new Leicester City boss Brendan Rodgers on expectations after taking over the 2015-16 Premier League champions. "I think the expectancy is to challenge for a European place and look to win a trophy," he said. "I think what Leicester achieved a few years ago was an incredible story, one of the most incredible in the history of football. "That will always be hard to repeat, but after a certain amount of years in the middle of the table, it's time to move. "I don’t want to put pressure on the players, we will see what we can achieve by playing our best. "The last couple of days have been really good, working with the players. There are areas we have to improve, there’s no doubt about that, but that will come in time." Finally from Jurgen Klopp on the reaction of captain Jordan Henderson to being subbed at Manchester United last Sunday and coming on as a late substitute against Watford. “I know he was not happy but he was completely OK," said the Liverpool boss. Everton got back to winning ways at Cardiff on Tuesday night and now boss Marco Silva wants to give their fans a first derby win since October 2010. He said: "If you ask for me as a manager now, and all our players, if we have something in our mind to give to for our fans, all of us will answer the three points on Sunday. "I’m sure we have to work really hard to ensure that, as well as the players on the pitch and our fans outside. We have to work together to win the match. It's everything we want to give our fans. "Last Tuesday night we achieved three points, just three points, and now we are preparing for another game but the mood of the players is different. That's normal (after a win)." Scott Parker isn't the only new manager to speak to the media today. New Leicester boss Brendan Rodgers has been answering questions for the first time since leaving Celtic to replace Claude Puel. “It was a very difficult decision," he said about leaving the Scottish champions. "If I was making this decision with my heart I would have been at Celtic for life because it is an incredible club and one I’ve supported all my life. “After nearly three years at Celtic, with everything we had achieved, I felt it was time to move on to my next challenge. “I have had opportunities to leave but this one was too good to turn down, with the ambition that Leicester have. “This is a group of players who are young and hungry. And they have needed stabilising with the emotions here on and off the pitch." Asked what his side must do to beat Liverpool, Everton boss Marco Silva said: "First we must be ourselves, to believe in ourselves. "Of course it's a long time without a win for us as a football club (in the derby), that means it's a difficult match. If we can perform the way we did in the first game in December it will be very good because we were very close to winning the match. We deserved something more. "It was a different part of the season for sure but we have to be ourselves first and be competitive, and derbies normally are very tough matches. The last one was very good but most derbies aren’t very good. "We have to do our best and 100% is sometimes not enough. In some moments you have to do more." Liverpool manager Jurgen Klopp has referred to this as Everton's World Cup final and the Toffees' boss Marco Silva has responded by saying: "It's a special game for both teams and for our fans. We have special fans and their fans also. "I didn’t see a big difference when I managed my first Liverpool derby. What I felt was a special match for both teams and they celebrated that lucky goal, that lucky moment they had in the last seconds of the match. "It was a World Cup final for us and for them because the way they celebrated was the same. I didn’t see a big difference really." Southampton climbed out of the bottom three with a 2-0 win over relegation rivals Fulham on Wednesday night. Boss Ralph Hasenhuttl added: "We can be a good opponent in every stadium for every team if we are well organised so I am positive. "We got a very important win on Wednesday and we can play with not much pressure (at Manchester United) because no-one expects anything from us. I don't know how they estimate us but we have shown that we can take points from away games. "It's fantastic for the players to go there now after Fulham because we can be brave and enjoy the game and maybe make a big surprise."